This versatile food is used in almost every cuisine in the world. Peanuts possess similar taste and nutrition properties as walnuts and almonds. The peanut, also known as groundnut or goober, is a legume grown in the tropics and subtropics for the seeds. The plant can fix nitrogen meaning that they can help improve soil fertility. For this reason, farmers add peanuts are part of crop rotations. Peanut pods develop underground rather than aboveground. This versatile food is used in almost every cuisine in the world. Peanuts possess similar taste and nutrition properties as walnuts and almonds. Here are 7 health benefits of peanuts. 1. Peanuts have been linked to longevity. High consumption of peanuts has been associated with a longer life. A large study with more than 200,000 people of European, African, and Asian descent concluded that people who ate regularly ate peanuts was associated with a substantially decreased risk of the death of any cause, specifically heart disease like ischemic heart disease and coronary heart disease. 2. Peanuts may help you control your weight. Despite being high in fat and calories, studies have shown that peanut consumption is correlated with a maintained healthy weight and decreased risk of type 2 diabetes. Researchers are still investigating the causation of the correlation. One study had women replace foods that have fat with peanuts on a low-fat diet. They found that the women three kilograms over a six-month period. More research needs to be done since the study sample was small. 3. Peanuts may help decrease the risk of gallstones. Gallstones are hardened deposits of digestive fluids like cholesterol or bilirubin that form in the gallbladder. The size can range from small as a grain to the size of a golf ball. The pain can be excruciating enough to be hospitalized. Cholesterol gallstones are the most common type and often appear yellow. Two observations suggest that frequent peanut consumption may reduce the risk of developing gallstones. 4. Peanuts may help reduce the risk of cancer. Peanuts are loaded with antioxidants like p-coumaric acid, resveratrol, and vitamin E, which could decrease the risk of some cancers. Antioxidants are substances that may prevent or delay cell damage by neutralizing highly reactive chemicals. Highly reactive compounds can directly alter DNA, proteins, and cellular bilayers. 5. Peanuts can help improve the neural function of babies. Peanuts are an excellent source of folic acid with 36 percent of your daily recommendation of folic acid for every 100 grams consumed. Doctors recommend women to eat more foods with folic acid before and during pregnancy to prevent the risk of neural tube defects like spina bifida and anencephaly. 6. Peanuts are loaded with minerals. Peanuts are loaded with minerals like magnesium, phosphorus, potassium, zinc, copper, manganese, and selenium. These minerals are vital to help control body metabolism, diabetes, arthritis, stress, asthma, skin care, muscle weakness, and blood pressure. 7. 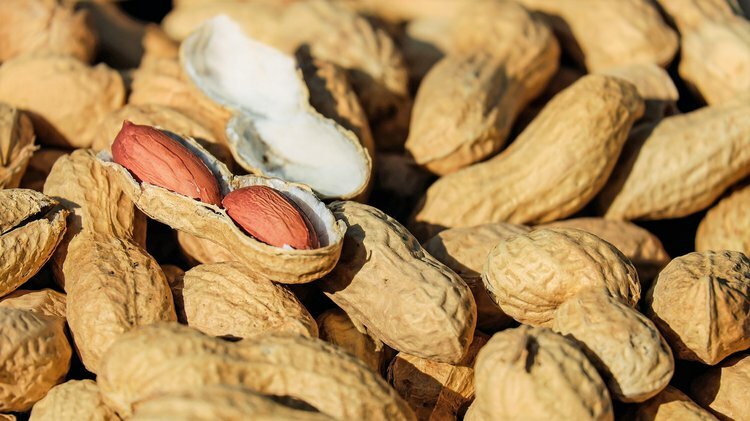 Peanuts could help fight anemia. Iron deficiency anemia is a common form of anemia where the body does not have enough iron. Iron is a vital mineral that helps red blood cells bind to oxygen with hemoglobin. One hundred grams of iron contains 13 percent of the daily recommendation. 1. Luu, H. N., Blot, W. J., Xiang, Y. B., Cai, H., Hargreaves, M. K., Li, H., ... & Shu, X. O. (2015). Prospective evaluation of the association of nut/peanut consumption with total and cause-specific mortality. JAMA internal medicine, 175(5), 755-766. 2. Moreno, J. P., Johnston, C. A., El-Mubasher, A. A., Papaioannou, M. A., Tyler, C., Gee, M., & Foreyt, J. P. (2013). Peanut consumption in adolescents is associated with improved weight status. Nutrition research, 33(7), 552-556. 3. Mattes, R. D., Kris-Etherton, P. M., & Foster, G. D. (2008). Impact of peanuts and tree nuts on body weight and healthy weight loss in adults. The Journal of nutrition, 138(9), 1741S-1745S. 4. Bes-Rastrollo, M., Wedick, N. M., Martinez-Gonzalez, M. A., Li, T. Y., Sampson, L., & Hu, F. B. (2009). Prospective study of nut consumption, long-term weight change, and obesity risk in women. The American journal of clinical nutrition, 89(6), 1913-1919. 5. O’Byrne, D. J., Knauft, D. A., & Shireman, R. B. (1997). Low fat-monounsaturated rich diets containing high-oleic peanuts improve serum lipoprotein profiles. Lipids, 32(7), 687-695. 6. Tsai, C. J., Leitzmann, M. F., Hu, F. B., Willett, W. C., & Giovannucci, E. L. (2004). A prospective cohort study of nut consumption and the risk of gallstone disease in men. American Journal of epidemiology, 160(10), 961-968. 7. Tsai, C. J., Leitzmann, M. F., Hu, F. B., Willett, W. C., & Giovannucci, E. L. (2004). Frequent nut consumption and decreased risk of cholecystectomy in women. The American journal of clinical nutrition, 80(1), 76-81. 8. Brand-Williams, W., Cuvelier, M. E., & Berset, C. L. W. T. (1995). Use of a free radical method to evaluate antioxidant activity. LWT-Food science and Technology, 28(1), 25-30. 9. Zang, L. Y., Cosma, G., Gardner, H., Shi, X., Castranova, V., & Vallyathan, V. (2000). Effect of antioxidant protection by p-coumaric acid on low-density lipoprotein cholesterol oxidation. American Journal of Physiology-Cell Physiology, 279(4), C954-C960.